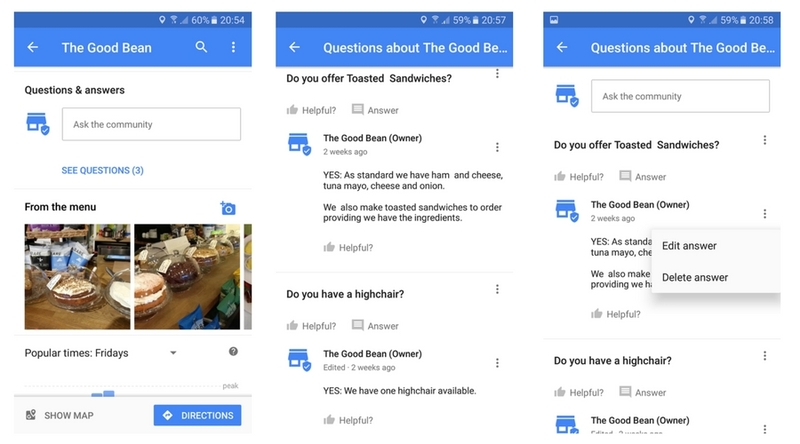 Google Maps launched Questions & Answers direct into a businesses Google Listing, allowing customers to ask the business questions and the business owner to provide an answer. This is currently only accessible in Android at the moment with other option rolling out later in the year. Questions and Answers allow business owners to answer questions directly from potential customers in the Google business listing. Merchants can also anticipate FAQ’s by adding commonly asked questions and their answers. Merchants and other users can both thumb up content to boost its position and flag content that is incorrect or spam. Google feels that users have many place-specific questions that are going unanswered right now. By allowing them to ask the business owner and each other, Google hopes to help users make decisions more quickly about a business. Do you have Gluten free options available? Are you located on the beach? Can you warm up a baby bottle? Do you accept credit / debit cards? Questions & Answers are being rolled out in stages in order to monitor the quality of the content. At the moment it is available on Google Maps for Android for all merchants. As a merchant of a listing, you will be able to add any commonly asked questions and answers to your listing. The next stage will to be to increase access to this feature to local guides level 2+ so that they can also ask and answer questions on Google Maps for Android. This is the stage I anticipate potential problems with Spam and low quality or irrelevant questions and answers being posted. Because this is run through Maps app and not the actual business listings dashboard, business owners will need to have the Google Maps app enabled ( sign in with your connected account ). Owners and managers will get push notifications from Google Maps on Android if a question is asked or answered by a user. Guidelines match reviews pretty closely, for factual questions, Google can take things down that are flagged as incorrect. The guidelines around spam and abuse are similar to reviews. This does not fill me with a great deal of confidence as reviews are probably the single biggest issue that businesses have at the moment with Google Business Pages. See: Why Most Fake Reviews Will Not Be Removed. 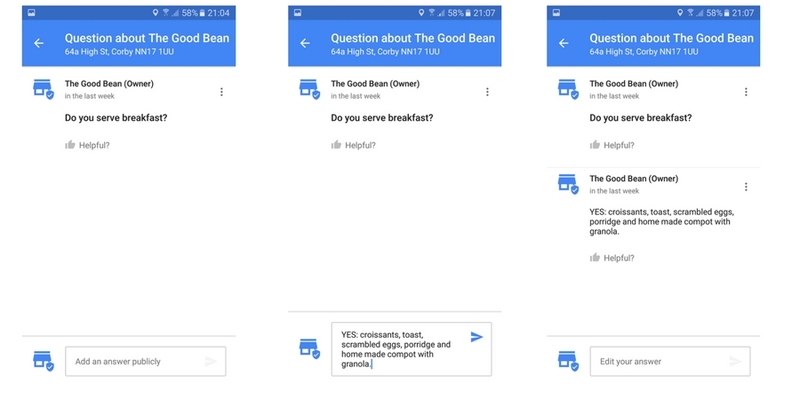 When this was shown to us pre-launch, almost all the Google TC’s voiced their concern regarding the opportunity for Spam together with the inability for a business owner to moderate the Questions & Answers themselves, rather then having to “flag” an incorrect or spammy question or answer and rely on a Google reviewer to check the accuracy. At the moment it is only accessible to the owner, the real test will come when they open it up to Local Guides and then subsequent access to all users.